Production Summary: All eleven songs were recorded specifically for this album. Nine of the eleven songs were newly written for this album, as "Eat It" and "Theme from Rocky XIII" were originally featured (in part) in Al's live food medley during the previous year's concert tour. Dr. Demento Status: Ten of the album's eleven songs have aired in full on the syndicated Dr. Demento Show, with the last songs to premiere on the show being "Theme from Rocky XIII" on July 29, 1984. By the time The Dr. Demento Show ended its run on terrestrial radio on June 5, 2010, "That Boy Could Dance" remained the only song from the album never played on the program--however, a brief excerpt was included during an in-studio interview with Al on July 18, 1999. Tour Status: As of this update, 95% of this album has been included in a regular tour setlist. Al's first top twenty album, fueled of course by the success of "Eat It." The first LP to credit Jim West as one of the band members. The first album to feature Al photographed on the cover. The first Al release to go Gold. The first ALbum to feature a polka medley. All five of the original songs on this album would be featured as b-sides on singles, which is quite a feat considering only three of the parodies were released as a-sides. Among Al's albums, this one holds the record of having the most songs off it appearing on domestic singles, not to mention the second most on worldwide singles. The back of the LP jacket features "3-D" pictures of each of the band members. These photos were removed when the album was issued on cassette and are also missing from most issues of the compact disc (the original 1987 issue of the CD contains the pictures on the inside of the folded insert). Above: Inside of insert of the original CBS compact disc. Released on compact disc in 1987, most likely because Al had not planned to release a new album yet and Scotti Bros. and/or CBS probably wanted something out in the market that year. Debuted at #185 in Billboard. It would jump into the top twenty just a month later, where it would stay for five weeks. It would eventually stay on the "Billboard 200" chart for twenty-three weeks, a record for an Al release until 1988. ALbum title/song connection: "Nature Trail To Hell" is about a fictional 3-D horror film. The choruses prominently feature the repeated lyric "Nature Trail to Hell in 3-D."
The triangles on the shirt that Al is wearing on the cover were originally white, but were tinted yellow by the art department (possibly to enhance the "3-D effect"). Etched onto Side 1 of most copies of the LP: "Polka Down With Your Bad Self." On Side 2: "Now How Much Would You Pay?" Some copies have the Side 1 etching, but not the Side 2 etching (this may also be true for other Al LPs with etchings). 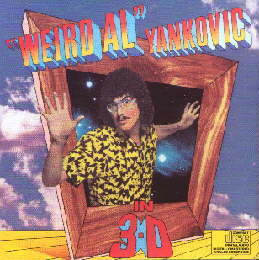 "Weird Al" Yankovic In 3-D ©1984, 1986, 1990 Scotti Bros. Records. ©1999 Way Moby/Volcano Entertainment III.